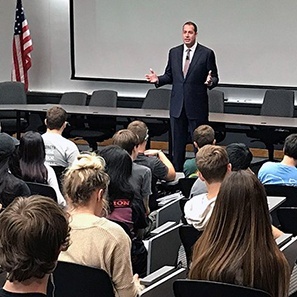 Students at Methacton High School in Fairview Village marked Constitution Day on September 17 with special projects and programs led by Partner Charles Eppolito, a 1988 graduate of the high school. Eppolito is the current president of the Pennsylvania Bar Association (PBA), the state’s largest organized bar association. The planned activities included a late morning classroom presentation and an afternoon auditorium presentation of “The Constitution is Everywhere,” an interactive discussion that challenges students and the educators and lawyers working with them to explore how the Constitution, a document signed by its drafters 231 years ago on September 17, 1787, still impacts every aspect of our daily lives. The students were asked about the things they do each day and the constitutional connections to each activity was highlighted. The students were then challenged to come up with any activity that is not connected in some way to the Constitution. David K. Trevaskis, the PBA’s pro bono coordinator, joined Methacton social studies teacher Anthony Maida and Eppolito in the presentation. Earlier in the day, a number of students were videotaped answering questions about their constitutional rights. Their edited responses were incorporated into a series of videos focusing on constitutional rights and responsibilities. Eppolito has made civic education a focus of his year as PBA president and the videos are being produced under his direction. Founded in 1895, the Pennsylvania Bar Association strives to promote justice, professional excellence and respect for the law, improve public understanding of the legal system, facilitate access to legal services and serve the 27,000 lawyers who are members of the association.